A new report from the Council of Infill Builders should be required reading for anyone who hopes to create a vibrant, thriving Downtown Stockton. The document, “Bringing Downtown Back: Ways to Boost Infill Development in the San Joaquin Valley,” is a blueprint for restoring the region’s derelict urban cores. Though it focuses on Kern and Fresno counties in particular, the strategies outlined by the nonprofit council of developers, urban planners and former public officials are applicable to Stockton which also suffered when growth marched outward during the past half-century. The report warns that if significant steps aren’t taken to change growth patterns that favor car-centered subdivisions far from city centers, cities such as Stockton will “repeat the development problems plaguing many metropolitan regions around the United States,” including paragons of sprawl like Atlanta, Phoenix and Los Angeles. True to its name, the Council of Infill Builders promotes infill residential growth as the key to preventing the Central Valley from becoming the Inland Empire of the north — or at least slowing the process. In addition to improving air quality by shortening commutes and reducing water use, more infill could mean a reversal of fortunes for downtown neighborhoods. “Accommodating new residents in infill areas — defined as resource-efficient, mixed-use neighborhoods where residents live within walking and biking distance of key services and transit — will help valley communities by revitalizing downtowns and boosting sales and property tax revenues,” write the report’s authors. Bottom line: Developers won’t invest in infill projects unless they can make money. As the council points out, infill remains more expensive than greenfield development, and cities lack the resources to make projects pencil out for their investors: It’s no crime, just reality. John Beckman of the Greater Valley chapter of the Builders Industry Association agrees with the report’s assessment of the challenges facing infill growth. Beckman said that developers, including one he spoke to in the past week, balk at new residential projects in Downtown Stockton because they doubt they can turn a profit with the rents they’d likely be able to charge. The primary reason that ledger sheets favor greenfield developments is that they’re artificially cheap. According to the Council of Infill Builders, edge-of-city building benefits from “subsidized highway and road building,” among other policies that externalize certain costs. To flip the market equation, the report suggests local officials “level the playing field.” Make infill cheaper — or sprawl more expensive — and builders will be more likely to pioneer in Downtown Stockton. But Beckman cautions against fees so high on outlying development that “it makes it so painful and so costly for people to live” in new, suburban-style communities. Beckman also said that any fee increases on outlying projects designed to pay for infill would likely face lawsuits brought by developers — he contends the “taking clause” of the Fifth Amendment, which prevents the government from taking property without providing just compensation, applies in such a case. The traditional development community will likely fight ideas like a distance-based fee that would account for the pollution and wear and tear on public roads that auto-based projects have on cities. Fortunately, other ideas raised in the report could generate across-the-board support and drive growth toward Stockton’s core. For example, leaders could relax parking and other restrictions on infill projects, waive fees for pioneer infill development, leverage transportation dollars to fund high-density growth near transit corridors, and advocate for the creation of tax increment districts that could funnel future property tax money back toward an infill area. 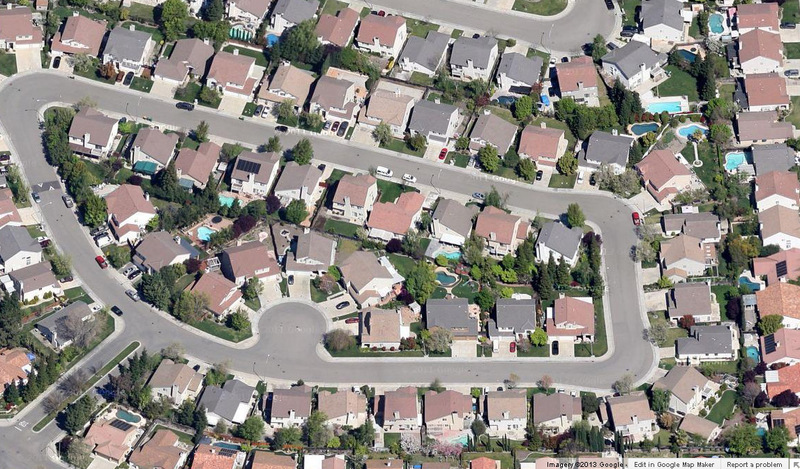 Amending the city growth ordinance could also be an option, as city of Tracy voters did in 2000 when they passed a cap on annual single-home building permits. Beckman even suggested that Stockton could essentially gift land or structures to anyone willing to give building in downtown a go. But relaxing infill restrictions alone won’t be enough. Downtown revitalization is like the old quandary of the chicken and the egg — which comes first, the demand or the amenities? 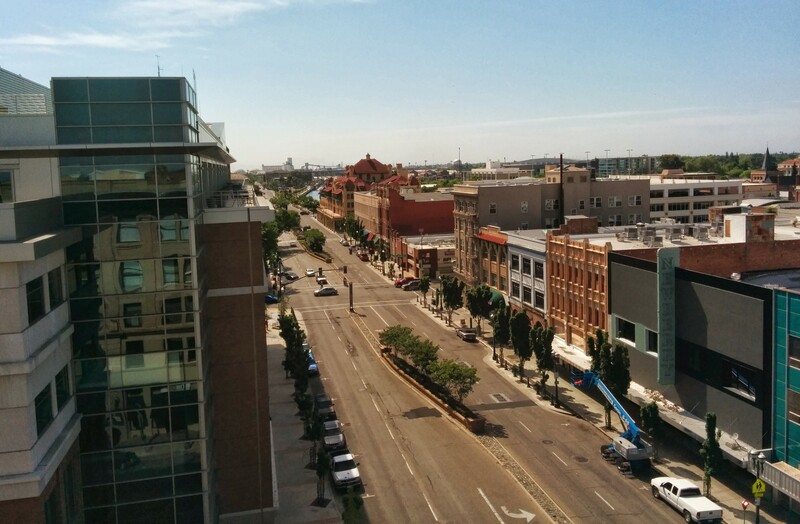 It’s true that demand for housing in urban areas such as Downtown Stockton is picking up. Slowly, a new generation of professionals are seeking areas with culture and basic necessities within walking distance. The anecdotal evidence of high demand for rooms at the University Plaza Waterfront Hotel reported by this website in 2013 corroborates the larger trend. But people won’t truly flock downtown until amenities are more robust. While marquee projects like the Bob Hope Theatre, Weber Point and the arena failed to become true economic catalysts, they do provide a foundation that Downtown Stockton can build on. 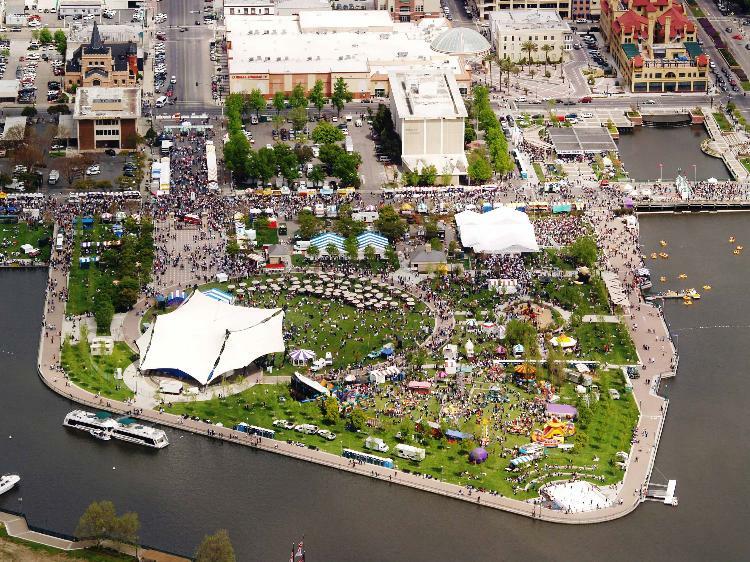 The report makes recommendations for low-cost ways to give revitalization a boost, such as facilitating “pop-up” or semi-permanent retail, food and festival-type events in downtown areas — a clear call in favor of keeping the Asparagus Festival at Weber Point and encouraging the expansion of events like the Wednesday farmer’s market. The report also asks government to be as flexible as possible when it comes to restrictions and permits that sometimes get in the way of downtown events. None of these suggestions are a magic wand that will transform our downtown overnight. But together, these common sense strategies could slowly push Stockton’s historic center toward a critical mass of organic, sustainable development. Some progress has already been made, and some signs from recent City Council meetings are encouraging. But it remains to be seen if local leaders will stand up and implement the policies necessary to change our traditional growth pattern to remake the face of Downtown Stockton and the city as a whole. The truth is that good planning requires no taking as Mr. Beckman implied. Instead planners and elected officials should simply provide services only to what is already built and ready to be rebuilt. When we finish our downtown development; which by the way provides LOTS of jobs for the trades, we can then carry on a more balanced discussion. Well, in terms of downtown amenity-attractions that appeal to the demographic with higher disposable income and to the educated tech-savvy young adult and culturally minded, those who would most likely desire to live in a vibrant urban culture and cosmopolitan environment, Stockton really needs to get some major downtown permanent cultural arts venues on the drawing board and built, or its core will continue to remain an eerie urban desolation. And I’m not talking about a fleeting staged seasonal event. It is this type of high-caliber centralized urban cultural arts amenity (this is what is key, the convenient urban centralization) that is required for the emergence of a thriving urban cultural environment and to precipitate vibrant activity, day and night. Right now there is absolutely nothing in Downtown Stockton on this caliber, level or vein, and this current cultural deficit does not fare well at all as an urban attractor. Really, until this is done you might as well just get used to Downtown Stockton’s eerie urban desolation, like in the film, “The Day the Earth Stood Still”. Stockton really needs to embrace that it truly is a city; not a pass through, not a truck stop or car rest stop, or a sleepy town. If the city continues to allow these fenced in housing tracts and expansive shopping centers with asphalt extending far across valuable soil, then there really is no point in planning a truly functional and vibrant downtown. City government tends to shoot itself in the foot when it comes to planning. There is a real need to take a much grander approach as to how much of a city (with all it’s urban amenities as Jon mentions) it desires to evolve into. I would just throw in there that all of the major structures built or rebuilt during downtown redevelopment should keep sustainability at the forefront. It just irks me to see so many missed opportunities that exist NOW without the need for ground up construction.Equally important is the major need for an improved visual appeal with all planned structures. There are plenty examples of sad and thoughtless designs in Stockton, why add more to the city’s core which deserves only the finest? In other words, don’t build a new Museum of So-and-So if it looks like something built to double as a bomb shelter or airport hangar. PRESENTATION IS EVERYTHING! Every time I look at LA’s Department of Transportation headquarters, I think of the Stockton’s courthouse….missed opportunity. I see what you’re saying. However, I get a knee jerk reaction when I see comments like this to ask how often you frequent the facilities that are there. I think “absolutely nothing in Downtown Stockton on this caliber” is a bit of an overstatement. There is the Bob Hope Theatre, Stockton Arena, the Mexican Heritage Center art gallery, the Farmers Market and others that need to see more community support before anyone will see putting more money into something bigger. I’ve been sorely disappointed so many times when these venues will host international caliber talent and events such as art walk, artist showings, concerts and the like only to have minimal audience attend. This goes to the point that there are these amenities in place and if we want to see bigger and better we need the other part of the equation: people. We need pioneer developers and residents in downtown walking the streets and telling the city, ok, we’re here. Lets make it bigger. This idea of “build it and they will come” has been done and failed. Stockton can’t afford another “cart before the horse” moment. Those are individual scattered venues that you pointed out, and that’s one of the flaws of Downtown Stockton— a hodgepodge of disjointed elements and a lack of predetermined design. I’m speaking of a specific cultural arts center like many cities have at one centralized location with a host or conglomeration of cultural arts venues featured. It’s not constructed in unison as you are imagining (“build it and they will come”), it’s done in piecemeal and phases through 2 or 3 decades. It is master planned in advance, the site is earmarked for a rational design scheme and purpose that is predetermined. If the city made such a plan BEFORE it is constructed, then the city could leverage it in a marketing campaign to lure new residents (“the other part of the equation: people”) to live downtown, knowing in advance what is on the horizon to come. It’s not the “cart before the horse”, but rather, it’s the road before the horse and cart.